SPCR • View topic - 1700rpm Yate Loon by Mad Dog?. 1700rpm Yate Loon by Mad Dog?. Post subject: 1700rpm Yate Loon by Mad Dog?. I bought one of these the other day....$10 at CompUSA. 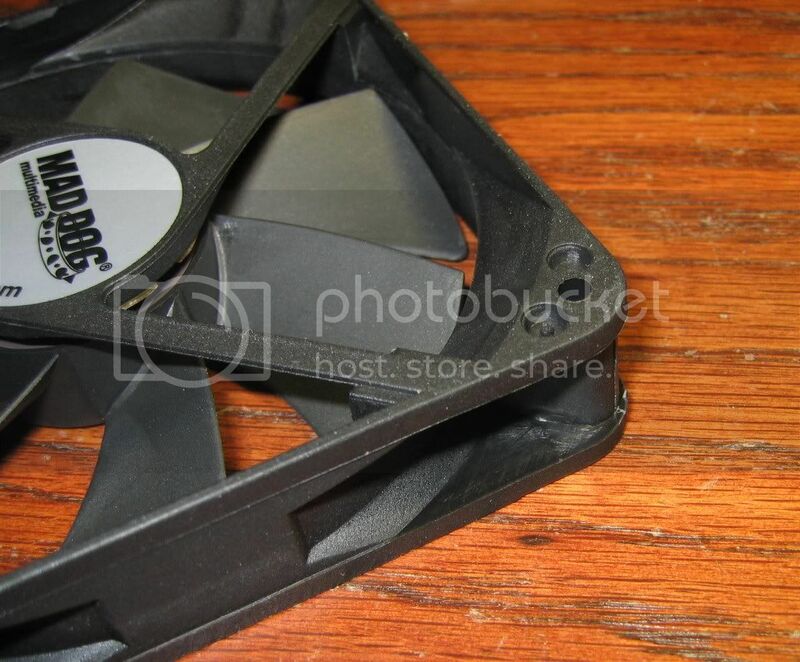 The frame of this fan is a virtual copy of a Yate Loon, without the Yate Loon logo on the edge. The sticker on the hub gives no indication of the make. At 1700 rpms it is more than 24db, but it's not bad. I haven't tried to undervolt it yet. So who makes it? Edit...We still don't know for certain, but it sure looks like a fast/medium-speed Yate Loon with a black frame. Last edited by Bluefront on Tue Mar 15, 2005 3:24 am, edited 1 time in total. Maybe Yate Loon? Just a wild guess. Yate Loon doesn't appear to make a fan with those specs. That's not to say that they don't and/or Mad Dog could just be making up their own specs, rather than copying their manufacturer. yate loon gets my vote to. So I found another (maybe) Yate Loon at CompUSA...another Mad Dog brand. This is a high speed model with Ball-Bearings. I examined it closely....and it looks exactly like the Blue LED Yate Loon from CompGeeks. The frame and the blade shape are exactly the same. This is an all-black fan, but with no Yate Loon logo. I'm convinced the Mad Dog whisper fan I bought last week is a medium speed Yate Loon. This one could be a high speed version. Ok, might have to pull the trigger on these and get a pair. Have you tried under volting them? How do they perform? I compared the noise of the slower model to an Orange Yate Loon.....by under-volting it til the two were turning the same RPM. Honestly, they sound so much alike, with my eyes closed I couldn't tell them apart. 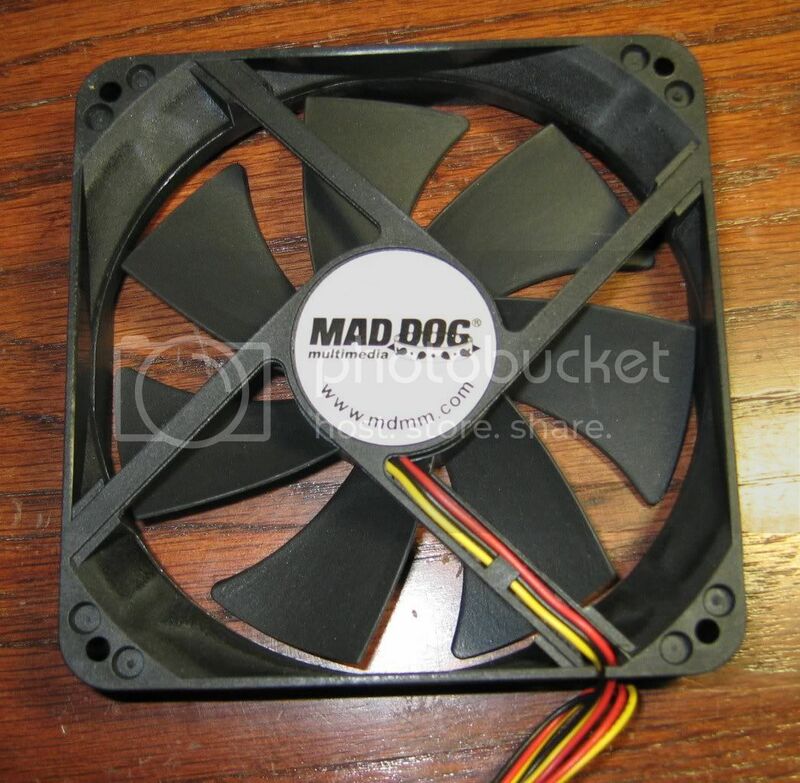 Unlike the Orange Yate Loon, these Mad Dog fans come with a 3-pin connector only. Worth a try...if you don't like it, take it right back. Well, I've emailed Mad Dog to find out who their manufacturer is. Hopefully they will get back with me tomorrow sometime. Have you tried peeling off the sticker and seeing if there is anything underneath? Does it really run at 1600RPM at 12v? I didn't try pulling off the sticker....doesn't look like there's anything under it. Mine does turn 1600rpms and sounds much like the blue LED Yate Loon at 12v. If you live close to a CompUSA, I'd buy at least four fans, pick the quietest, take the rest back. I may have to do that tomorrow after work. I sure hope this computer has another fan adapter on the motherboard (AMD Duron 850MHz on an MSI MoBo - currently working on getting a new computer after shipping my current beast to my sister). One last question if you don't mind (you have been very informative). Is it closed corners like the Yates? Everything on the frame is Yate Loon. The frame is a black exact copy of an orange Yate Loon, complete with closed corners. The fan blades are shaped exactly like the Blue LED Yate Loon. If it's not a Yate Loon......it has to be a TT fake. Did you look on all four sides for a small "Yate Loon" (maybe 1/16" high letters) cast into the plastic? Well, I picked 2 of these up. The only markings I see on the case are is a small box which has arrows for fan rotation and air flow. The stickers will probably come off tonight and we'll see what is underneath. I did some searching, and it appears that most sleeve bearing fans running under 2000RPM are about $20. So picking a 1800RPM (that is what it says on the box) or less (Bluefront says 1600RPM) fan for $10 is a great deal in my mind. I think I have a Zalman Fanmate around here, so I'll crack open this computer and see how it does. Did they ever respond, or did they do the dodgy "We make it ourselves" thing. They emailed me back saying "our fans are made by many manufacturers in mainland China." So I reminded him that I had the question for a perticular model and asked again where that model was made. No responce so far. I'm planning on picking up one tomorrow. I have a question concerning QA for those who have tried this fan. Does QA look good enough to purchase only the number of need fans (in this case just one), or should they be purchased in bulk and "cherry picked"? I picked up a pair of these at CompUSA yesterday...and though I can neither confirm nor deny that these may be Yate Loon relabels (no stamping or stickers point to this)...I can confirm this: These fans are pretty damn quiet. I can best describe the noise as a pleasent hum. I won't say that they are Nexus quiet, but these fans have a very good noise to cfm ratio. I'm running them with out any voltage mods or fan controls to speak of...so I can't comment on how well they'll work with voltage mods or controllers. Sorry I can't provide more details, but I don't believe my MB is reporting fan speeds correctly. I'll update when I have a fan controller installed. So, wether or not these are Med. speed Yate Loon relabels, they seem to be pretty quiet and solid fans so far. That's funny to see this post cause I was just at CompUSA the other day and was starring at those fans. With the reviews on this thing, I might just have to pick one up. You guys think It'll be any good as a psu fan mod? BTW....do you guys really trust mad dog products? I've heard some crap about them in the past, but not much. I picked of a pair of these as well but have only been able to get a general idea of how good they are via an old AT PSU w/ fan removed that I used for fan testing. I'll post later on tonight with some highres pics as well, but just as a quick comment, they're good fans but not the best. If you need a fan right off for an emergency or can't get ahold of OEM Nexus (low speed yate loon), they're perfect. Probably the best store-pickup out there. But I, like prophetsix, wouldn't rank then with the Nexus. On the side, my two MadDogs start up just fine at 5v, assuming my AT PSU's voltages are fairly tight. Again, I'll post more later. liquid_celica, if you do go for one, make sure you *don't* get the ball-bearing one. Personally though, if you can shell out the extra money on the Nexus, I would. Of course an OEM Nexus would probably be the best choice, the MadDog is certainly a good choice. No, in general I put Mag Dog in the junk category. However, as a "re-labeler", I guess, like perhaps in this case, they could be good. After all, as the saying goes, a dead clock is right twice a day. Last edited by DrCR on Mon Mar 14, 2005 10:37 am, edited 1 time in total. If they really are medium speed Yate Loons, which I'm convinced is true...I wouldn't be concerned about the name on the label. BTW....mine runs at 1700rpms @12v. This is about the same as the blue LED Yate Loon fan, which sounds the same. Isn't the blue LED Yate Loon BB or am I rembering wrong? Besides, you might get one of the bluefront returns. I did retest my globe and it sounded really good. Its too bad they are not available anymore. My only blue Yate Loon is in use right now....but I think it was advertised as a sleeve bearing, and the "SL" in the model # indicates it is. Anyway, it sounds like the Orange Yate Loon when you slow it down a bit. The Mag Dog Yate Loon, sounds the same to me. Of course, I really only bought one to try out. The mad dog has a lot of bearing noise followed by the cheiftec, but the blue led model was really good w/o any bearing noise. Good, then it's not just me. My pair of MagDogs' bearing noise at 5v sound just like my Zalman 92mm fan that came with my old Zalman 6500 HS when the fan mate is set to min. The MagDogs don't have any airflow faint higher frequency woosh that the Zalman does though, just bearing noise (both at Vmin) . 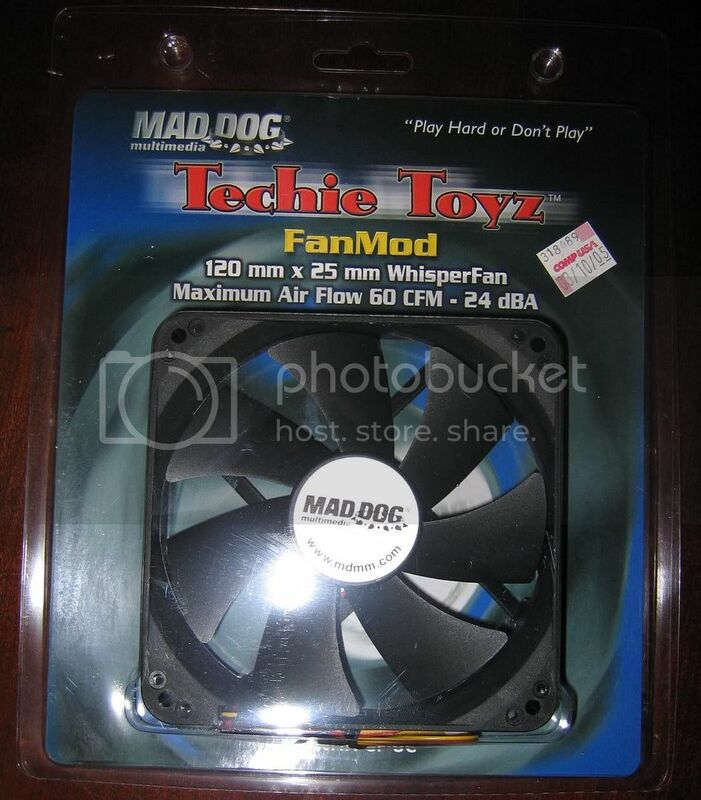 The Zalman is a 2BB fan too (RDH9025B) so that speaks pretty low of my MadDog samples. I concur with you FG. Their not really that bad, but I'd also say they're not really that good. I'm halfway tempted to return them and buy a pair Nexus fans or perhaps try out the tek-chains, but I don't feel like spending the extra money nor taking the trouble for this particular machine. Its too bad they are not available anymore. So did Globe indeed cut production of this fan, or are you just commenting on how there are currently no known vendors? Thanks. does anybody know how the 90mm WhisperFans are? I'm planning to replace the fan on my zalman 7000cu since it seems to be the loudest part in my computer now. As far as I know, they're just not available here anymore. dyle, definitly go for the Nexus if you're going to mod your Zalman 7000. You can get the 92mm at a lot of places now, as I found out when bargin hunting a Thermalright SI-97. Try a froogle.com search if you want, or just head over to siliconacoustics or endpcnoise.